The PCE-TP E series pallet balance is verifiable, but does not have two ramps. This pallet balance is ideal if you do not wish to put the pallet directly on the ground. Place the pallet balance on the pavement, align it, connect the control terminal and begin weighing. 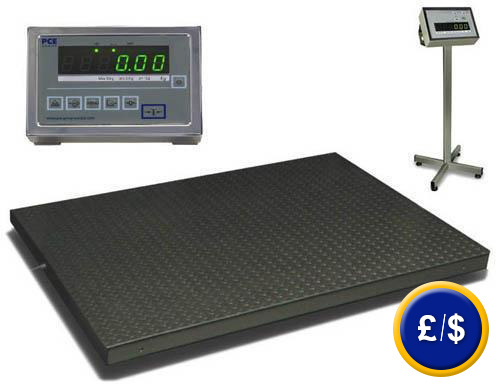 The balance is verifiable and meets commercial class III requirements for weights and measurements. It comes verified from the manufacturer. After two years of use it is recommended to verify the balance. This can be done at any verification center in your region. This link shows an overview of the available pallet balances. - Verifiable, and comes verified from the manufacturer. - Tare, sum and piece counting functions. - Display has 3 meter long cable. - RS-232 port to transfer data to a computer. - A tripod is included. - Acceptable for weighing according to commercial class III. Software in German and data cable. Software allows to transfer data with date and time to a computer. Data can also be exported to other software such as MS Excel. To print results in situ. The printer includes RS-232 cable and 230V mains adaptor. Paper width for the printer is 112 mm. Here you will find an overview of all the balances available in the pffer of PCE Instruments.